There will be no shortage of eggs come Sunday but to avoid sugar overload this year the Easter bunny will be filling baby peanut's basket with some non-candy treats. Today i'm sharing these items with you. If you ask me, they truly are the best kind as they last a lot longer. 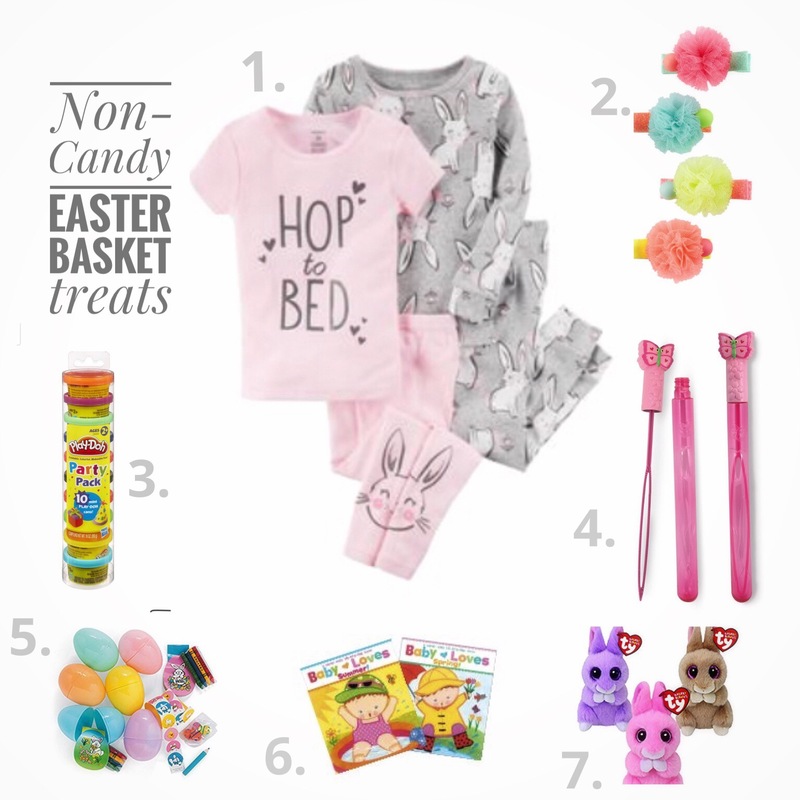 They’re simple, stree free, practical items that will keep your little one entertained while you indulge in some chocolate or perhaps a glass of 🍷. Go ahead mama you deserve it! Happy easter! Baby peanut loves to bake and I love Pinterest so we're in the kitchen stirring, whipping and testing out a new Pinterest recipe this week. It's become our little obsession which, is not really helping me with my waistline situation. This week we are whipping up a batch of the busy baker's best ever banana muffins. The recipe is very simple and we were able to whip it up in no time. We mixed the dry ingredients together. Put them in the oven and for 20 mins and then volia! These Best Ever Banana Muffins are the best banana muffins you'll ever try! And so easy to make in just one bowl! Preheat your oven to 350 degrees Fahrenheit and line your muffin tin with 12 paper muffin cups. In a large mixing bowl, mash the bananas with a fork until no large pieces remain. Add the sugar, egg and oil and mix with a wooden spoon until everything is incorporated. Measure the flour, baking powder, baking soda and salt into a separate mixing bowl and stir them together with a fork. 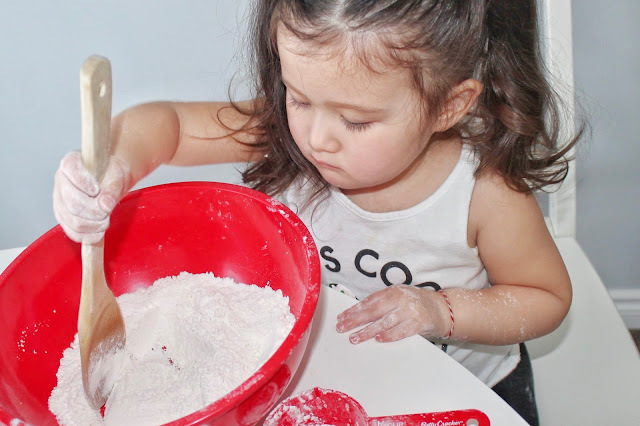 Once they’re mixed together, dump the dry ingredients into the wet ingredients. 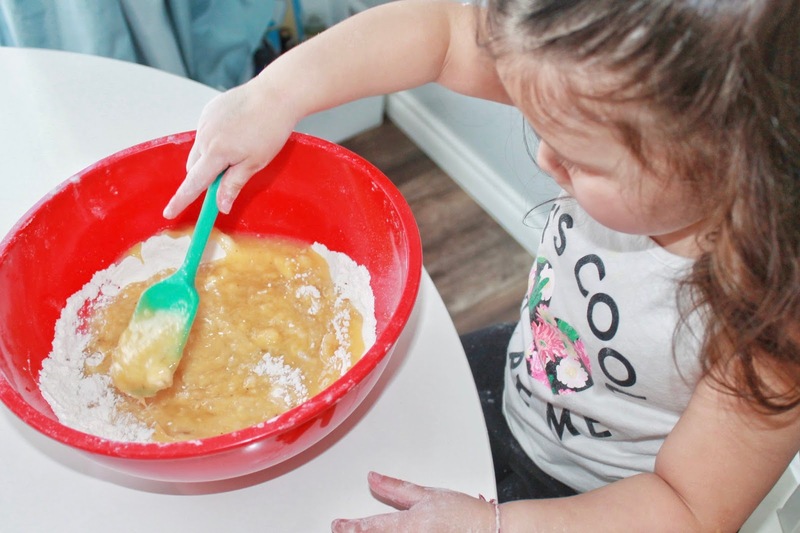 Using a wooden spoon, carefully mix the wet and the dry ingredients together. The danger here is over-mixing which will result in dense, flat and dry muffins. The best technique for mixing is to scoop underneath the mixture and pull up gently instead of stirring around in a circle (like you’d stir your coffee, for example). Continue mixing this way just until the dry ingredients have been incorporated. It’s fine if there are a few small streaks of flour in the batter; it’s the large pockets of flour you want to make sure are incorporated. Bake the muffins in the oven at 350 degrees for about 23 minutes (anywhere from 22-25 minutes, depending on your oven), or until they are golden brown. Let them cool in the tins for about 5 minutes and then turn them out of the tins to let them cool completely on a cooling rack. Or, enjoy one warm from the oven slathered in butter. Starting solids is undeniably one of my favorite milestones. I love watching the expressions on their tiny little faces as they experience different textures and flavors. 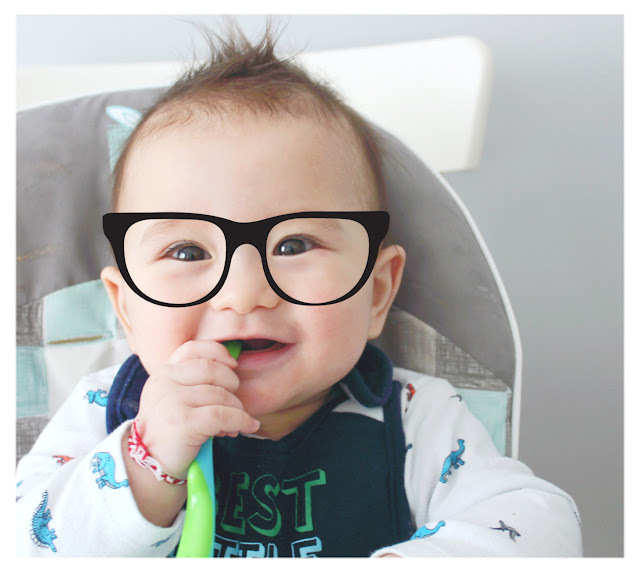 Now that I have successfully introduced solids to two little humans, I thought I would share a few of my secrets for a seamless transition. With both children I introduced strained peas first. It’s packed with nutrition, contains fiber and protein which helps prevent constipation and keeps their bellies full. I skipped rice cereal altogether. Rice tends to constipate. I opted for something with whole grains like oatmeal. My secret weapon. I serve up at least an ounce of strained prunes for dessert after lunch or dinner everyday. Prunes are magical! They have a ton of fiber and are fantastic to prevent and alleviate baby constipation especially when you are trying different foods. I used the Munchkin mesh bags for my daughter and although she loved it, I hated it. They were really hard to clean so I tossed them after a couple uses. With my son I discovered the Boon Pulp and we both love it. I stuff it with fresh fruits or steamed vegetables and he goes nuts. It’s like a giant lollipop but filled with good stuff. Its easy to clean, just pop the top off and wash in warm water or toss in the dishwasher.